Do you have a weakness for the flavors of chocolate and peanut butter? Does your heart flutter at the thought of a Peanut Butter Chocolate Chip Drop Cookies recipe that is packed with chopped roasted peanuts and semi-sweet chocolate chips? Then you are going to fall in love with these Peanut Butter Chocolate Chip Cookies - a simple peanut butter drop cookie enhanced by a generous helping of peanuts and chocolate chips. If your best chocolate chip cookies recipe and peanut butter cookies recipe ever got together to combine creative forces, this recipe would be the likely result! You will want to use natural salted peanut butter for this recipe, not the commercial hydrogenated kind. Laura Scudder's and Smucker's are two brands I depend on. Trader Joe's brand is a good option too if you are lucky enough to have a Trader Joe's in your neighborhood. These Peanut Butter Chocolate Chip Cookies are good keepers too. They will last up 2 weeks at room temperature in an airtight container but you need to do a little planning when the peanut butter chocolate chip cookies craving strikes because the dough needs to chill at least 2 hours before baking. You are instructed to drop the peanut butter chocolate chip cookies dough by rounded tablespoons onto your cookie sheets. This task has become so much easier since I began using a cookie scoop. And remember, it is always best to bake your cookies one sheet at a time in the center of your oven, if time permits. And never, never, put cookie dough on still warm cookie sheets or it will melt before it has a chance to bake. In a small bowl whisk together the flour, baking soda, and salt; set aside. In a large bowl with an electric mixer on medium-high speed, beat the butter until creamy, about 2 minutes. Add brown sugar gradually, beating until light and fluffy, about 3 minutes. Stop once or twice to scrape down the sides of the bowl with a spatula. Add the egg and vanilla, beating again until smooth. Slowly stir in the flour mixture, beating on low speed just until incorporated. Cover the bowl with plastic wrap and chill dough at least 2 hours. Preheat oven to 350 degrees F. Line baking sheets with parchment paper or silicone liners. Drop chilled dough by heaping tablespoons (or with a medium cookie scoop) onto lined cookie sheets, leaving at least 2 inches between cookies. Flatten cookies with the back of a fork - The marks should show. Bake for about 15 minutes or just until the tops and edges begin to turn light golden brown. Place baking sheet on wire rack to cool for about 5, minutes then transfer cookies to wire racks to cool completely. 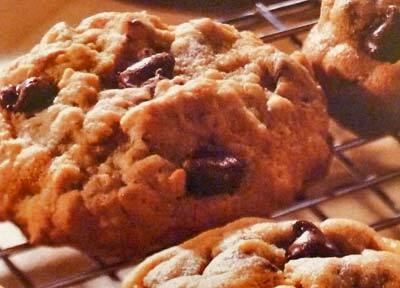 This recipe yields about 2 1/2 dozen Peanut Butter Chocolate Chip Cookies. Peanut Butter Milk Chocolate Chip Cookies: Substitute milk chocolate chips for semisweet chocolate chips. Peanut Peanut Butter Chip Cookies: Substitute peanut butter chips for the semisweet chocolate chips. Chunky Peanut Butter Cookies: Eliminate the chocolate chips and increase chopped peanuts to 1 cup. 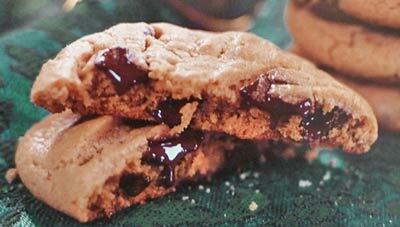 Recipe Source: This peanut butter chocolate chip cookies recipe comes from A Baker's Field Guide to Chocolate Chip Cookies by Dede Wilson. Are you looking for an even easier recipe for Peanut Butter Chocolate Chip Cookies? In a small bowl stir together the flour, baking soda, salt and cinnamon; set aside. In a large bowl with an electric mixer on medium-high speed, beat the butter, granulated sugar, brown sugar and peanut butter until creamy. Gradually beat in the dry flour mixture. Drop cookie dough by rounded tablespoonfuls onto ungreased cookie sheets, spacing them at least 2 inches apart. Press down to slightly flatten cookies into 2-inch circles. Bake for 7 to 10 minutes or until edges are set but centers are still soft. Let cookies stand on cookie sheets for about 4 minutes before transferring to wire racks to cool completely. This recipe makes about 3 dozen Chunky Chocolate Chip Peanut Butter Cookies. In a large mixing bowl, cream the butter, granulated sugar and brown sugar. Beat in the eggs, vanilla and peanut butter until well mixed. Slowly add the dry flour mixture to the creamed mixture and mix until thoroughly combined. Stir the chopped chocolate pieces into the dough. Roll dough into 1-inch balls and place at least 2 inches apart onto prepared sheets. With the back of a fork, press down to slightly flatten cookies. Bake for 8 to 10 minutes or until edges are golden. Remove from oven and let cookies stand for about 2 minutes before transferring to wire racks to cool completely. This recipe makes about 480 Peanut Butter Chocolate Chunk Cookies.